Access classes and other declarations from your Objective-C code in Swift. The process for using your Objective-C declarations from your Swift code within mixed-language targets differs slightly depending on whether you’re writing an app or a framework. Both processes are described below. If you accept, Xcode creates the bridging header file along with the file you were creating, and names it by using your product module name followed by "-Bridging-Header.h". 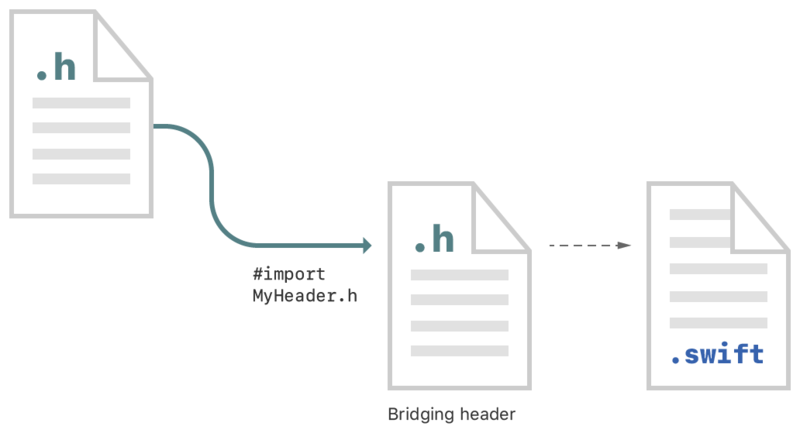 Alternatively, you can create a bridging header yourself by choosing File > New > File > [operating system] > Source > Header File. Any public Objective-C headers listed in the bridging header are visible to Swift. The Objective-C declarations are automatically available from any Swift file within that target, with no import statements. Use classes and other declarations from your custom Objective-C code with the same Swift syntax you use for system classes. Under Build Settings, in Packaging, make sure the Defines Module setting for the framework target is set to Yes. In the umbrella header, import every Objective-C header you want to expose to Swift. Swift sees every header you expose publicly in your umbrella header. The contents of the Objective-C files in that framework are automatically available from any Swift file within that framework target, with no import statements. Use classes and other declarations from your Objective-C code with the same Swift syntax you use for system classes. Access Swift types and declarations from within your Objective-C codebase.